Homemade Italian Sausage Bread Stuffing made with day old Ciabatta bread, sweet Italian sausage, onions, celery and fresh herbs is perfect for a weeknight side dish or your Thanksgiving table. 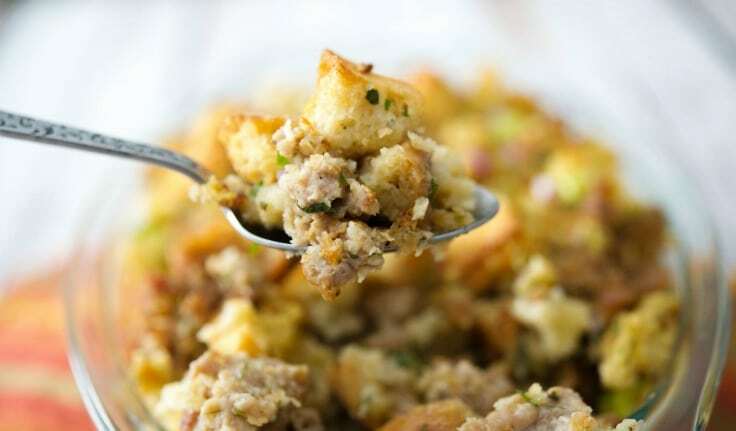 As much as I love turkey on Thanksgiving, stuffing has to be my favorite side dish because I don’t eat it another time of the year. 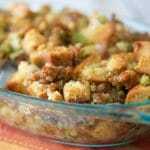 I’ve made several stuffing recipe variations over the years like this one with chorizo and this one made with butternut squash, but this Italian Sausage Bread Stuffing was definitely on the top of my favorites list. I generally purchase packaged stuffing mix (not the actual boxed stuffing where you just add water, but rather the cubes of stale croutons) to make my stuffing, but I had a half of a loaf of Italian Ciabatta bread left over. So I decided to make a new stuffing recipe to go with the roasted chicken I was making for dinner and since Thanksgiving is only a few short weeks away, I was killing “two birds with one stone” so they say. I cut the bread into small cubes; approximately 1-inch in diameter and laid them on a baking sheet; then sprayed them with cooking spray and baked them in the oven for about 15 minutes until they turned golden brown. While the bread was toasting, I browned my ground sausage on top of the stove in a skillet until no longer pink. If you can’t find ground sausage at your market, you can use sausage links and remove the casings. Add the cooked sausage and toasted bread to a large bowl; then add chopped onion, celery, parsley, sage, rosemary and garlic powder. Heat 2 cups of chicken stock; then add 1 cup of it to the bowl and mix well. Gradually add the remaining chicken stock 1/4 cup at a time until the stuffing is wet. You may not need all of the stock or quite possibly you may need a bit more. You want to make sure the bread is wet, but not dripping with excess liquid. Add the stuffing to a 2qt. baking dish; then cook at 350° for 20 minutes until it’s heated through and golden brown on top. You can also prepare this the night before and keep refrigerated until you’re ready to cook and serve. 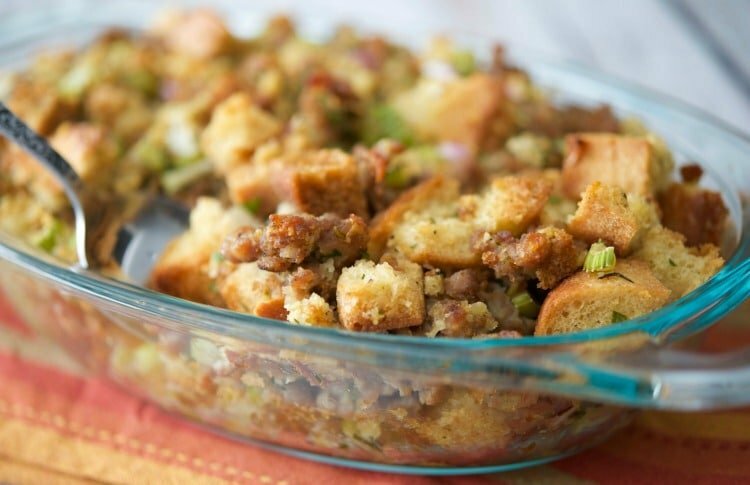 This recipe for Italian Sausage Bread Stuffing makes 6 cups (or twelve 1/2 cup servings) and was delicious. Forget about serving this only for Thanksgiving, I’ll be making it all throughout the year as well. This would even taste great as a stuffing in mushrooms. ~Enjoy! Place the cubed bread on a baking sheet; then spray them with cooking spray. Bake in the oven for about 12-15 minutes until they turned golden brown. Add the cooked sausage and toasted bread to a large bowl; then add the onion, celery, parsley, sage, rosemary and garlic powder. 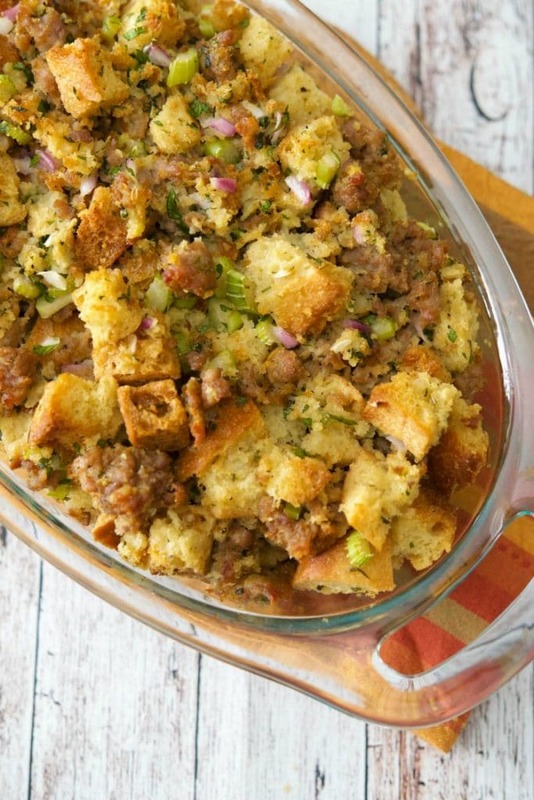 Add the stuffing to a 2qt. baking dish; then cook for 20 minutes until it's heated through and golden brown on top. 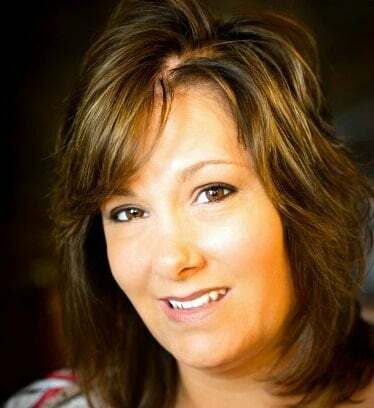 Stay up to date on all of my latest recipe experiments by signing up for my weekly newsletter. Yes, you can make it the day before, though I don’t cook it in the oven until the day if. I don’t like making things too far in advance because then it shortens the shelf like after. Happy Thanksgiving! If you prepare it a day before would you add the chicken stock?